Neither Greg Abbott nor Wendy Davis has spent much time talking about the energy industry and regulations. But Texans should have little trouble distinguishing their positions. 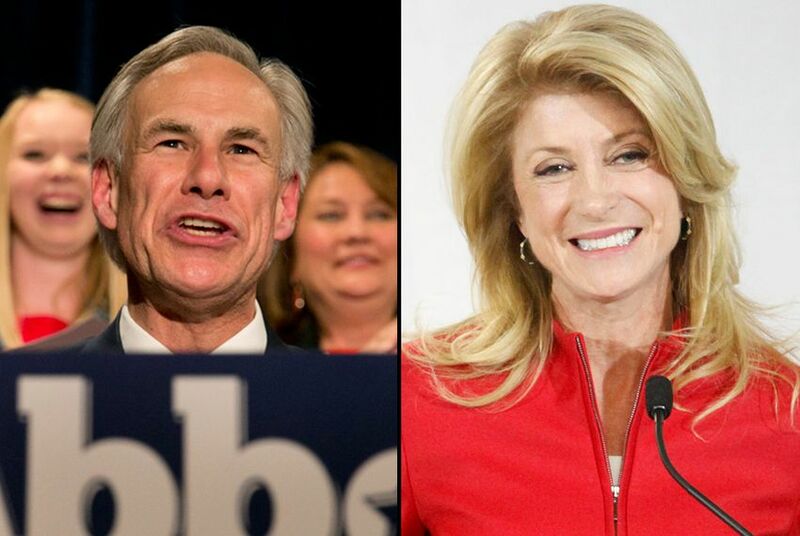 Greg Abbott and Wendy Davis have sparred over education. The issues of officeholder ethics and equal pay have also surfaced. But in the head-to-head battle for Texas governor that began well before each party officially nominated its candidates, neither Abbott, the state’s Republican attorney general, nor Davis, a Democratic state senator, has paid much attention to the earth-fracturing elephant in state government: the state’s rapid growth in oil and gas production. As Texas deals with a drilling boom that has brought a windfall to its coffers but has also strained services and raised environmental concerns, Abbott and Davis have concentrated on bite-size policy questions. But Texans should have little trouble distinguishing their positions when the two candidates — neither of whom agreed to an interview for this article but submitted short statements — fully enter the tangle of issues surrounding the state’s drilling bonanza. As a lawmaker who has grappled with oil and gas policy, Davis has a more detailed record on energy issues than Abbott, whose campaign has painted her as an extremist. Spurred by technological advances like hydraulic fracturing, Texas has reached production numbers unseen in more than three decades. It is pumping more than twice the oil it did three years ago, accounting for more than a third of all domestic production, even as production surges elsewhere in the country. That has been good news for the state’s budget. In December, the comptroller predicted that Texas would collect at least $2 billion more in taxes from energy production by 2015 than it originally forecast, adding to its surplus. The phenomenon, however, has stirred concerns about air and water quality and strained infrastructure in some regions, including roads and emergency response capabilities. Davis was a Fort Worth city councilwoman when the sprawling city, now speckled with some 1,700 wells, was among the nation’s first to embrace urban drilling. She had a front-row seat as companies blasted apart the natural gas-rich Barnett Shale, generating about $264 million for the city from 2006 to 2012. “She realized that this was going to impact virtually every department within the city of Fort Worth,” said Jim Bradbury, an environmental lawyer who was a member of the city’s early gas drilling task force. During her time on the council, Davis helped shape the city’s pipeline rules and a drilling ordinance — one that limits noise, keeps most drilling 600 feet from homes and spells out duties for local inspectors — that other American communities have modeled. Davis also used her office and legal background to assist mineral-rights holders when energy company representatives flocked to the city in the mid-2000s in hopes of purchasing drilling rights. The councilwoman encouraged residents to form neighborhood associations and pool leases. A 2007 article in the Fort Worth Star-Telegram described a meeting she helped organize between representatives from Fort Worth Energy and homeowners on the city’s south side, many of whom spoke only Spanish and struggled to understand parts of their contract. She publicly questioned several clauses, including those that allowed the company to explore for minerals other than natural gas and required homeowners to pay part of the cost of transporting gas extracted on their property. The company’s president agreed at the meeting to strike the clauses for new leases. In 2009, Davis later took those interests to Austin. As a state senator, she wrote or sponsored more than 20 bills related to oil and gas — few of which became law. That included proposals to require energy companies to monitor groundwater before drilling and disclose chemicals used in fracking fluid. She also pushed for stricter oversight of air quality near drilling rigs and worked with state regulators to position air monitors throughout the Barnett Shale. In one case, she received support from pipeline operators — and eventually Gov. Rick Perry. She wrote legislation that allowed saltwater pipeline operators to send drilling wastewater to disposal sites using pipelines that stretched across state rights-of-way. The bill was aimed at reducing truck traffic that would have otherwise been needed to haul away waste above ground. Sharon Wilson, a Texas-based organizer for Earthworks, a nonprofit that has pushed for more industry oversight, said that not all environmentalists agreed with Davis but that they generally appreciated her body of work. Abbott’s campaign, however, said Davis’ policies would add costs to businesses and consumers and jeopardize jobs. “Sen. Davis’ record makes it clear she has more in common with radical environmentalists than the people of Texas,” Matt Hirsch, the campaign’s spokesman, said in a statement. By contrast, the attorney general, whose campaign said it would release detailed proposals “in the coming months,” has defined his track record on energy mostly in the courts. His barrage of lawsuits against the federal government — including more than a dozen against its Environmental Protection Agency — show that he would have the energy industry’s best interests at heart, Hirsch said. Several of Abbott’s lawsuits against the EPA sought to ease restrictions on carbon pollution, siding with drillers and electricity generators. “I will continue to fight the Obama Administration’s runaway EPA and will do all that I can to prevent unnecessary and unlawful federal regulations from getting in the way of Texas’ economic success,” he said. During his stint as a Texas Supreme Court justice, however, Abbott disagreed with oil and gas companies on at least one case. In 1996, Abbott signed onto a dissenting opinion written by Justice Alberto Gonzales after a majority ruling in Heritage Resources v. Nationsbank set a high bar for mineral leaseholders who try to recoup lost royalties from energy companies that deduct certain production costs — even when a contract appears to forbid the practice. Such disputes are still common.